I bought some Melody from Bendigo in several colours a few months ago. It's a lovely yarn, merino, cashmere and microfibre. This navy yarn was well into the Celtic Hearts Shawl when somehow I reversed the directions and began patterning on the wrong side. I was interrupted with two rows left to frog and put it aside. Of course, it hasn't been touched for weeks, so I ripped it all out. It appears black here but is really a rich shade of navy. It's a very easy yarn to knit. I'm using 5 mm Harmony circulars here for it and the pattern is showing up quite well. Pattern is Brandywine which I have done once before. 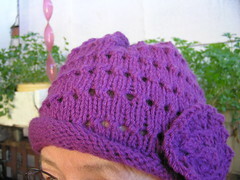 I have done eight of the fifteen repeats after the bottom fifty-six rows. This, of course, is still unblocked but it will be great when that is done. I'm very happy with it. 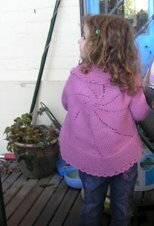 The yarn is still available on Bendigo website but some colours have sold out. At $4 ball, it was good buying, particularly considering that another brand, which appears identical, is much dearer than that. I've used that other brand and this certainly seems the same to knit. I've been very grateful for my knitting lately. It's been great on the stressful days I've had recently particularly over the last month. I didn't take it on court appearance days, as I wasn't sure I'd get it past security and also as I was somewhat more dressily dressed than I often am. I did not want knitting bags etc breaking that appearance. The Jindabyne Cowl which I did then at home was very useful. It was good wool, almost, but not quite mindless knitting. There was just enough patterning and counting to take my mind off other things, but not so much that I made mistakes when I was distracted. This shawl is easy in that the patterned lace part stays the same all the time. The increases show up in the garter stitch centre panel. Hopefully I can soon pick up something more complicated and concentrate on moving my life forward. I had a call from my solicitor at lunch last Friday, (today's Tuesday), that final papers were ready for me to sign. This signing should have been done at least two weeks ago but was delayed by stupidity and also by stubbornness. A threat that court could not only sign for him but that he may well be in contempt of court brought results. I raced out to Penrith from Sydney, signed them. They go to court for final preparation and seal and I'll have them back in about a week. There's still the house to sell, and that won't be pleasant, but the end of this is in sight. I sat on Penrith Station in the cold afterwards, feeling rather numb. I've found the procedure quite unpleasant. I've moved past any emotional attachment long ago, circumstances forced that, but the end of so many years was hard. There was no inter-urban train due for quite a while, so I caught the much slower suburban train, just to get off the cold platform. It was cold and dark when I reached my station and was also raining. I had to ring to get my son to pick me up. While we waited for DIL to arrive home, so we could eat dinner, I checked my email. Second blow for the day. My sister is a survivor of breast cancer for thirteen, nearly fourteen years. It's returned a couple of times and she's had a reconstruction done by a top plastic surgeon in Sydney after a full mastectomy. The other breast had had a reduction so both matched. She's raised many thousands of dollars for research, rows dragon boats in racing, raises money for other charities. It's back. It's back in the pectoral muscle we all have on chest. However this lies under the reconstruction. Cancer there is not totally unknown, but it's very rare. She almost died in that reconstruction operation when a re-routed blood vessel did not work for a while. Both the plastic surgeon and the cancer surgeon will be required for the operation she needs in early August. She may lose the reconstruction. Not only that, but there's a spot on her lung which worries me more than the recurrence. It's very small, shows on PET scan, but is too small to biopsy. If this is also cancer, then it's the first sign of a secondary from the original breast cancer and that is very bad news indeed. I felt gutted as I read her email and was very ragged around the edges all weekend. I've been knitting and letting things play around in the back of my mind. There is little I can do about my sister. I don't know where I want to live in a few months or whether I want to buy or rent. I have great family and friends who care for me and look out for me too. I will be fine, although things will be rough for a while yet. The knitting is a soothing presence in my life. It must be so hard for you to go through such stressful times. I hope your sister's health improves and the operations go well for her. I hope everything is sorted out for you too very soon. Legal matters always take so much emotional strength to deal with dont they. Knitting does seem to help in times of stress doesnt it. I have to agree with you that the Melody yarn is beautiful to knit with. I bought some of the navy too but missed out on the red. I hope everything goes well for your sister, she sounds a very positive person and that can help. Bah humbug to the whole legal thing. The sooner it is over the better and I understand about the lack of emotional effect, it is then a great big nuisance. Oh I have felt some Melody and it is lovely. I could be tempted if there is some green left!! I'm glad your long struggle is nearly over, but I'm sorry to read about your sister. Tough times. Knit on. There's nothing like signing legal papers to make a person feel a sense of, I don't know, dread or emptiness or something. Even if it (signing the papers)is for a good reason. But to get the news of your sister on top of that. Well no wonder you are glad of your knitting. I'm so sorry that it looks like bad news for her - I sincerely hope things are not as bad as they seem, and the operations go well for her. My thoughts are with you, best wishes for your sister and also hope there is positive news. I feel bad you were sitting at the cold station and not feeling so good when I was in an warm office just across the road, small world as they say and who were we to know we were in such close proximity at that point in time. I would have been happy to meet you for a cuppa. Glad you feel you are moving forward from the situation. It's amazing the therapy that knitting gives, a lot of the girls from work who have started knitting in the last few months have commented on it. One actually saying she doesn't need her medication anymore. I'm glad you have your knitting to help you stay sane! My sister went through a messy divorce and now is FREE! She is enjoying singledom and not having some carping horrid man bringing her down. I'm sorry about your sister - as you know I know all about that stress!